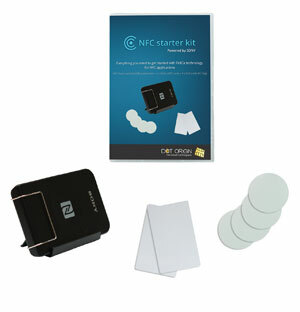 This kit contains everything you need to get started with FeliCa technology for NFC applications. Using the included reader, drivers and utilities, you can identify, read and write different types of NFC cards and tags, while the downloadable Sony SDK for NFC provides full programming tools and APIs for accessing FeliCa cards and tags from your own software applications. The FeliCa RC-S380 desktop USB reader is the world's first NFC Forum certified reader that supports and communicates with cards and devices that conform to NFC specifications as well as various other contactless technologies, including FeliCa and ISO 14443 A/B. The RC-S965-based, 50mm diameter, self-adhesive FeliCa Lite tag operates at 13.56MHz wireless frequency and contains 224 bytes, whilst the RC-S962-based FeliCa cards contain 2k bytes of usable read/write memory. The kit also includes a free trial copy of Read-a-Card, a software application that enables easy card and tag reading as well as integration with other Windows software, web applications and databases for NFC, enrolment, loyalty and many other applications. Further supplies of cards and tags are available from our online shop.